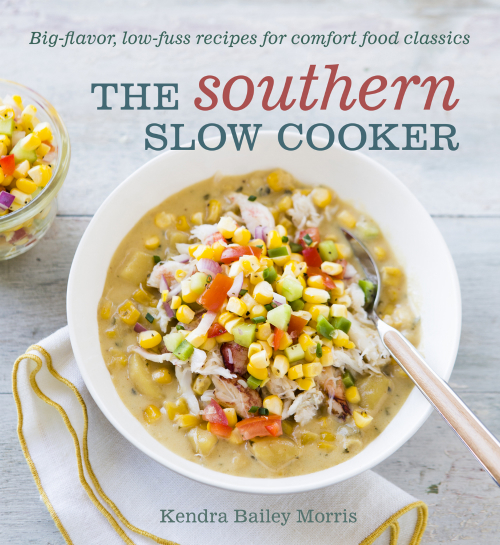 Kendra Bailey Morris, a friend and fellow Richmond cookbook author, food writer, recipe developer, and television host has released her latest cookbook — The Southern Slow Cooker. I could not be more excited to share a recipe from the book and give you the opportunity to win your very own copy in a giveaway at the bottom of today's post. I recently attended the release party for The Southern Slow Cooker and scurried home excited to come up with a recipe to share. 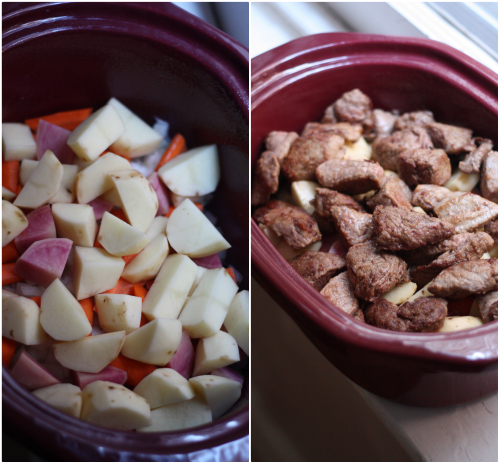 After dusting off the vintage slow cooker (as you will see from the photos below) and with cooler weather on the horizon I decided on Aunt Barbara's Beef Stew. This stew is such a warming dish, filled with plenty of vegetables, beef, and a hint of red wine — a recipe that makes your house smell OH-SO-GOOD! Spray the inside of the slow cooker with cooking spray. Layer the onions, carrots, and potatoes in the slow cooker. Combine the stew meat, flour, salt, and black pepper in a large resealable plastic bag and shake to coat well. Heat a large cast-iron skillet or nonstick pan over medium-high heat. Add the bacon grease and let it melt. Shake the excess flour off the stew meat and add enough to fill the pan without crowding (you may have to do this in batches). Brown well on all sides, about 5 minutes, then transfer the meat to the slow cooker. Add the wine to the skillet and cook for 1 minute. Add the beef broth. Using a wooden spoon, scrape up all the bits off the bottom of the pan and immediately transfer the stew meat and broth mixture to the slow cooker. Add the tomatoes, tomato paste, Worcestershire sauce, garlic, bay leaves, sugar, parsley, paprika, oregano, thyme, and basil. Give it a stir. Toss in the rosemary. Cover and cook on low for 8 to 10 hours, until the meat is tender and the stew has thickened. Uncover, discard the bay leaves and the rosemary sprig, and season with salt and pepper. At this point, if you desire an even thicker stew, you can crank up the heat to high and continue to cook, uncovered, until thickened. 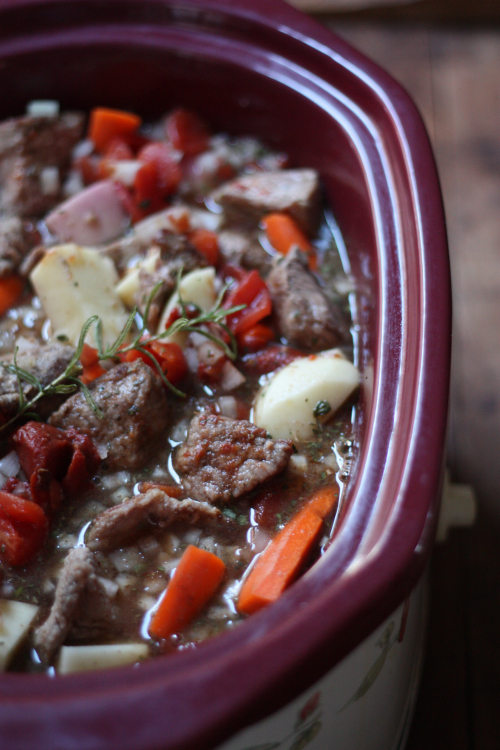 Serve the stew in bowls garnished with additional rosemary or fresh parsley, if desired. 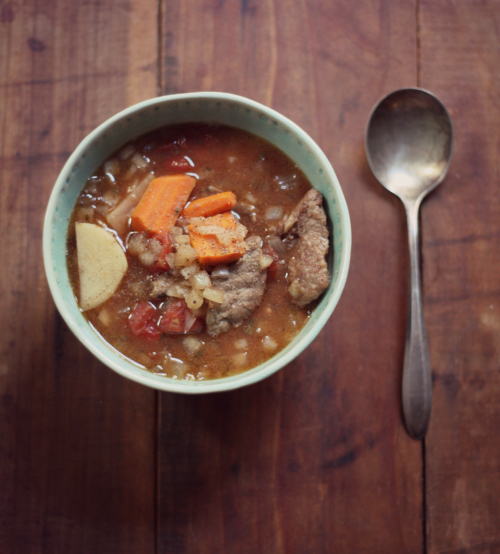 This recipe was reprinted with permission from The Southern Slow Cooker by Kendra Bailey Morris, copyright © 2013. Published by Ten Speed Press, a division of Random House, Inc. Reviewing the cookbook reminded me of how most recipes only require the crock pot as a cooking vessel, so it really does save on the amount of dishes required to make a particular meal. Assembling a recipe the night before allows for putting it on the morning and letting it cook while you are at work or just running errands. You can see from the photo above that I have the classic 1980's motif for my vintage crock pot, nonetheless it still created a stew that my family certainly enjoyed! So happy my crock pot has moved to the front of the kitchen cabinet because of this cookbook and these recipes. They are unique and filled with stories that only Kendra can tell through her family history. If you just cannot wait for this giveaway to end to see if you have won, find copies available for purchase at Fountain Bookstore in Richmond Virginia or Amazon are a couple of options to get your copy in the mail right away! 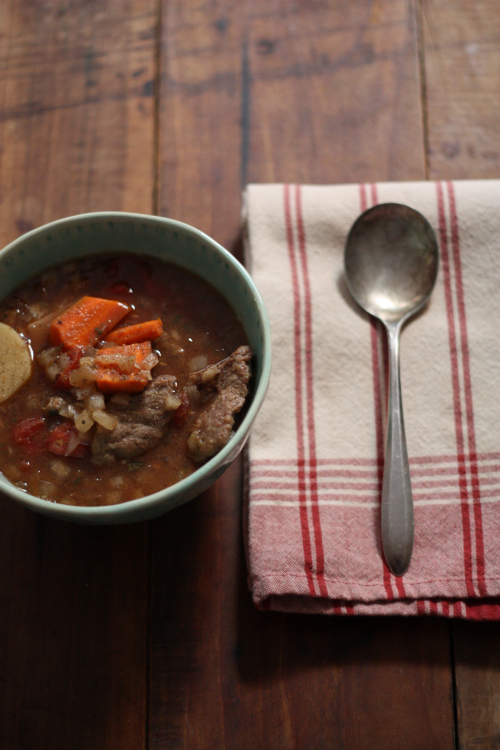 Enter the giveaway below for a chance to win a copy of The Southern Slow cooker of you own! To enter, simply use the Rafflecopter form below — it should load right below this paragraph. For those unfamiliar with Rafflecopter, you fill in the fields using your choice of Facebook or your email, which is only used to contact the randomly selected winner (no spam) — it's that simple. the last time i used my crock pot was last march ~ it was vegetarian corn & potato chowder ~ yum. i usually have to adapt crock pot recipes a bit to suit our meatless diet. I like to use my crockpot for my Asian BBQ rib tips. Also to cook my Pinto Beans overnight. I can also cook on low a wonderful Pork Roast or Beef Pot Roast. I cook more in my Crock Pots and Microwave Oven than my regular oven. I made a pulled beef and it turned out ok! I can't wait to try some of the recipes from the book. I love to use my slow cooker. I make cheese dip for every party. It's veggie friendly, delicious, and it makes for great, post-party leftovers. I made a pot roast. While I love my crockpot, especially in the winter, I've fallen into a bit of a cooking rut and could spice things up wiht some new recipes. I made a wonderful Vegetarian Pumpkin Chili last week and am going to make apple butter in the next week or two with my crock pot. I've recently discovered your blog and love it! I am a fellow Virginian! Either Chili or a whole chicken with veggies -- both equally delicious! 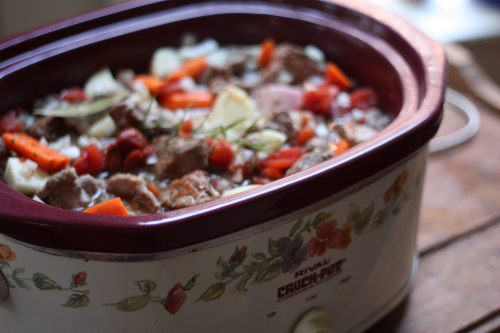 I use my crockpot every week - often multiple times per week. Just made apple sauce yesterday in it. Looking forward to this cook book! slow cooker pork for bbq sliders! I made slow cooker pork as well! I really should pull my crock pot out more frequently, it's so versatile! Last thing I made was bbq chicken. Would love to expand my options! I made pork chops! looking forward to the winter and making new recipes! vegetable stew last week with veggies from the garden.